Our newest design! This ultra cotton Ladies T-Shirt is made from 100% preshunk cotton, female cut features the saying, "If mama aint happy, nobodys happy. 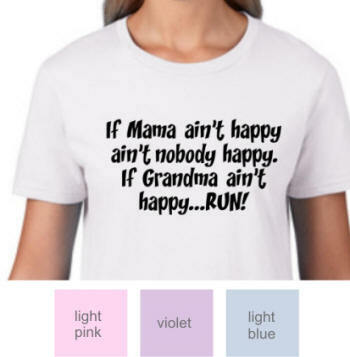 If Grandma ain't happy...RUN!" Available in sizes S-XXL and in the following colors: White, violet, Light pink, and light blue. Print is in black. Order one for Grandma today! Orders ship in about a week.